MADRID (AP) — Real Madrid is making it clear it's still in the fight for the Spanish league title. With a convincing victory in the Madrid derby on Saturday, Real Madrid returned to second place in the Spanish league for the first time since September and moved within five points of leader Barcelona, which has a difficult away match against Athletic Bilbao on Sunday. "We reached our goal, which was to regain second place and move closer to the lead," Madrid captain Sergio Ramos said. "The league isn't over yet. There are many points still up for grabs. We will keep fighting until the end and we will keep trying to make things difficult for Barcelona." 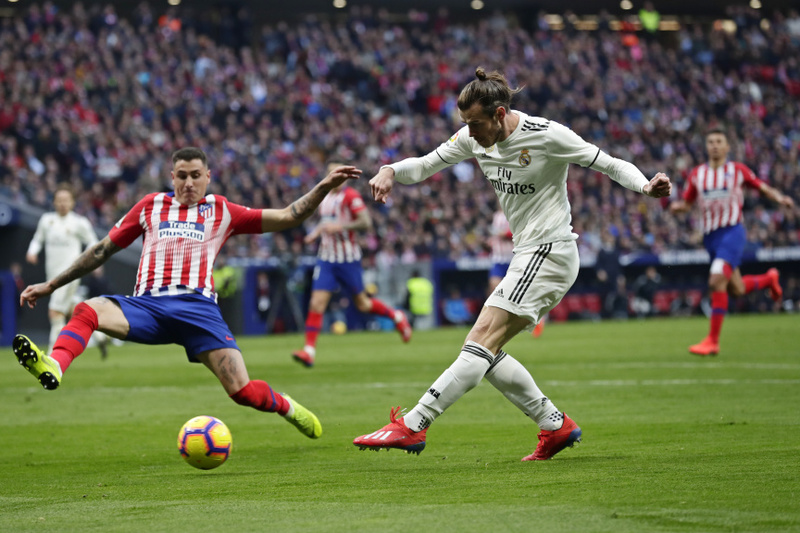 In a derby marked by video review, Real Madrid defeated Atletico Madrid 3-1 at Wanda Metropolitano Stadium with an overhead kick by Casemiro, a penalty kick converted by Ramos, and a second-half goal by Gareth Bale. "You need to play a complete match to win here, and we did that," manager Santiago Solari said. Antoine Griezmann scored for Atletico, which lost at home for the first time this season. Diego Simeone's team stayed six points off the lead. Griezmann's goal was initially disallowed for offside but the VAR reversed the call. Video review also had to be used to confirm the penalty that led to Ramos' goal just before halftime, and to verify another offside call that disallowed a second-half equalizer by former Real Madrid forward Alvaro Morata. It was also used when Morata wanted a penalty call — not awarded — later in the game. Atletico, coming off its first league loss since the third round, played a man down from the 80th minute after midfielder Thomas Partey was sent off for a second yellow card. The city rivals drew their last four league matchups, and Real Madrid's last win against Atletico was nearly two years ago in the Champions League semifinals. Casemiro opened the scoring with an overhead kick after Atletico's defense could not fully clear a corner kick. Griezmann equalized less than 10 minutes later by sending a shot underneath goalkeeper Thibaut Courtois. It took a while for the video review to reverse the offside call that initially disallowed the goal, keeping a record crowd of more than 67,752 at the Metropolitano from being able to celebrate. Vinicius Junior made a great run down the left side and was brought down from behind by Jose Maria Gimenez just inside the area. Ramos converted the 42nd-minute penalty. Madrid sealed its fifth straight league win with Bale's low shot from a pass by Luka Modric in the 74th. Bale, who replaced Vinicius Junior earlier in the second half, appeared to provoke the Atletico crowd during his celebration near the sideline. Courtois, who used to play for Atletico, was loudly jeered from the start. Atletico fans threw stuffed rats toward the goalkeeper from behind one of the goals. Ten-man Getafe defeated Celta Vigo 3-1 at home to lift the southern Madrid club into fifth place, one point behind Sevilla. Getafe conceded two minutes into the match but rebounded despite playing a man down from the 37th because of a red card to forward Maxi Gomez. All three Getafe goals came after the red card. Celta stayed 16th in the 20-team standings. Espanyol defeated Rayo Vallecano 2-1 at home with a winner by Sergi Darder five minutes into stoppage time, ending a four-game winless streak in the league. The result kept Rayo in the relegation zone, one point from safety. Girona, the first team outside the relegation zone, had its winless streak extended to 13 matches in all competitions after losing at home to last-placed Huesca 2-0.